Science Coaches is a joint ACS and AACT program that partners coaches (volunteer chemists) with AACT teacher members in elementary, middle, and high schools. Please join Adam Boyd, the AACT Program Director, as he outlines the benefits for teachers and coaches in the Science Coaches program. The article describes the author’s use of demonstrations to spark interest and investigation in chemistry. This teaching strategy has been both valuable and popular with her students. In this simulation, students will reference an activity series and a solubility chart to accurately predict the products of single replacement and double replacement chemical reactions. Governing Board elections are open now through April 30! In this news post, Kim Duncan, our Sr. Professional Learning Associate, writes about lessons and other activities that could be used in an Acids and Bases unit. Celebrate Earth Day on April 22 with chemistry! We've rounded up resources from the AACT classroom library related to Earth Day, and to this year's Chemists Celebrate Earth Day theme, "Chemistry Helps Feed the World." 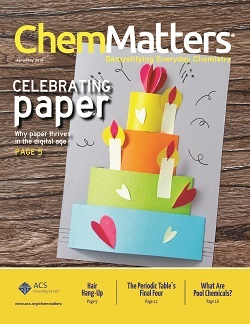 The April issue of ChemMatters is available now!